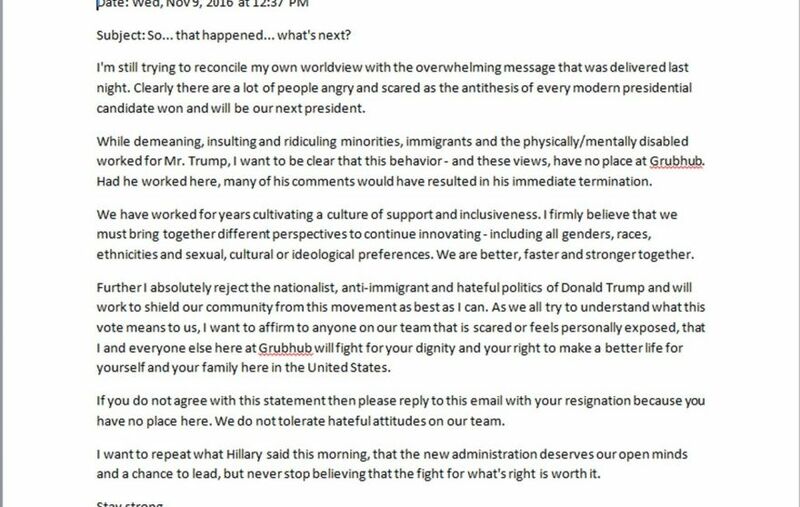 GrubHub CEO, Matt Maloney, is verging on the edge of insanity by suggesting any employees who are pro Trump should reply with their resignation letters to a letter he sent out after the historical election of Donald J. Trump. Grubhub is a popular online food delivery service, I have used their app in the past myself. When asked for comment by Fox News, Maloney told Fox News that “almost 20 percent” of his employees have personally thanked him for the note. “I am not embarrassed by it,” he said. However, I like many, will not be using them again until the Board at Grubhub replaces their current CEO, Matt Maloney. This year’s presidential election was undoubtedly divisive and left many of our employees feeling concerned. In response, I wrote a company-wide email that was intended to advocate for inclusion and tolerance, regardless of political affiliation, during this time of transition for our country. Grubhub shares are down 9.4% over the past two days due to the offensive comments about the presidential election from CEO and Founder Matt Maloney. I for one, am sick of being called a racist, and worse by the Hillary supporters and campaign. You can disagree with someone without being a racist. They are the ones that sent the #Birddoggers and other plants throughout the entire last year to incite violence and more. Hillary Clinton’s candidacy was so flawed from the beginning that they had to do something to try to win so they stooped about as low as you can go and started riots, used hate speech, cheats and more to try to gain an advantage but the American people are too smart to fall for their tricks now. How do you feel about Matt Maloney and Grubhub now?